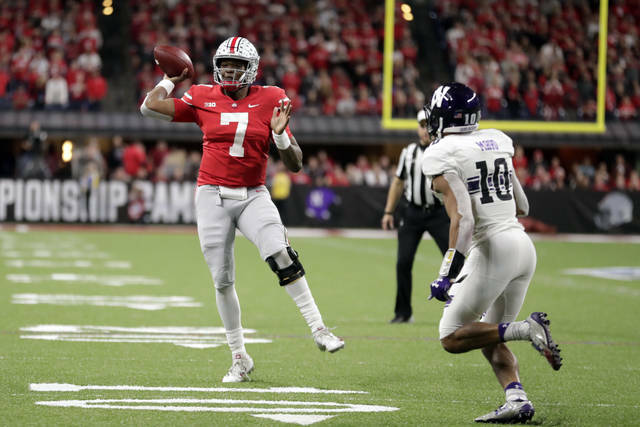 Shortly after Haskins made his case to win the Heisman Trophy by throwing five more touchdown passes, the Buckeyes defense fended off a second half charge from No. 21 Northwestern and Meyer put his hands on a third conference championship trophy in five years as the conversation quickly turned to the more immediate fate of No. 6 Ohio State. Three spots in the playoff appear to be locked up after No. 1 Alabama beat No. 4 Georgia in the SEC title game and Clemson claimed another ACC crown by routing Pittsburgh. Alabama, Clemson and Notre Dame are all unbeaten and are expected to claim the top three spots. With No. 5 Oklahoma beating No. 9 Texas in the Big 12 title game, conventional wisdom suggests the Buckeyes (12-1, 9-1, No. 6 CFP) may come up short in their playoff quest. One argument in favor of Ohio State: It is playing well. The Buckeyes have won five straight overall, piling up 107 points in the last two games — against two stingy defenses. Haskins was lights out again Saturday, finishing 34 of 41 with 499 yards and one interception and was an easy choice as the game’s MVP. The Buckeyes started fast — scoring just 10 plays into the game when scrambled to avoid a sack and bought just enough time to hook up with Terry McLaurin for a 16-yard TD pass . And after allowing John Moten IV to tie the score with a 77-yard TD run midway through the first quarter, Ohio State closed out the half with a flurry. J.K. Dobbins scored on a 2-yard run, Blake Haubeil made a 42-yard field goal and McLaurin caught a 42-yard TD pass from Haskins to give the Buckeyes a seemingly safe 24-7 halftime lead. The Wildcats answered quickly in the second half. Clayton Thorson scored on an 18-yard run to make it 24-14 and his 2-yard TD pass to Cameron Green made it 24-21 with 8:03 left in the third quarter. Thorson went 27 of 44 with 267 yards, one TD and two interceptions for the Wildcats (8-5, 8-2, No. 21). Instead, Haskins found Chris Olave for a 29-yard TD pass and sealed the win with two more touchdown passes in the final 10 minutes — a 9-yarder to Johnnie Dixon and a 17-yarder to Dobbins. 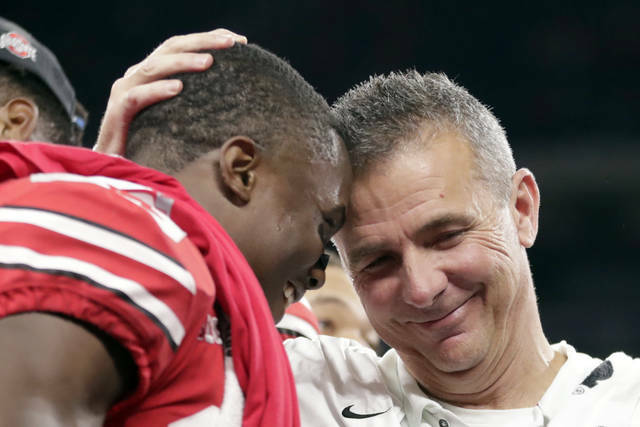 The ensuing celebrations included Haskins striking the Heisman pose , Meyer hugging those around him and Buckeyes players waving championship memorabilia as they await the committee’s final decision. Northwestern: The ascending Wildcats showed some true grit after an abysmal start, which could have buried them. Now they must find a way to clear the next hurdle and win a conference crown. Ohio State: The Buckeyes played like one of the nation’s top teams during a dominant first half and during closeout mode. But in between, they struggled to put away the Wildcats. Northwestern: Moten had four carries for 76 yards and Isaiah Bowser wound up with 13 carries for 60 yards. … Thorson made his 52nd career start, a Big Ten record. … Fred Wyatt blocked an Ohio State field goal. Ohio State: Dixon had seven catches for 129 yards, Parris Campbell had seven catches for 89 yards, Olave finished with five for 79 and McLaurin had three receptions for 78 yards. … Dobbins ran 17 times for 68 yards and became the first player in school history to record 1,000-yard rushing seasons as both a freshman and sophomore. “I feel like we have a team worthy of it, a team that can go make a run,” Sooners coach Lincoln Riley said on ESPN. The Sooners (12-1) will face No. 1 Alabama (13-0) in the Orange Bowl on Dec. 29 in a matchup of Heisman Trophy front-runner quarterbacks — Kyler Murray of Oklahoma and the Tide’s Tua Tagovailoa, who sprained his ankle in the Southeastern Conference championship game Saturday and is expected to be laid up for two weeks. The rest of the New Year’s Six bowl matchups are UCF vs. LSU in the Fiesta Bowl; Florida vs. Michigan in the Peach Bowl; Ohio State vs. Washington in the Rose Bowl; and Texas vs. Georgia in the Sugar Bowl. Georgia (11-2) dropped a spot to fifth and Ohio State (12-1) remained sixth in the selection committee’s final top 25. The Bulldogs lost to Alabama in the SEC championship game Saturday and the Buckeyes won the Big Ten against Northwestern. The Sooners paid back a three-point loss to Texas in a Red River Rivalry rematch. “This is an art, not a science,” said Mullens, who is the athletic director at Oregon. Oklahoma’s conference championship gave it the edge over Georgia. The Bulldogs’ strength of schedule, with losses to ranked teams, gave Georgia the edge over Ohio State, Mullens said. Oklahoma is making its third appearance in the five-year-old playoff. Defending national champion Alabama has played in them all. Clemson is making its fourth straight appearance. Notre Dame is in the playoff for the first time, making it 10 teams in five seasons to participate in the playoff. Unbeaten UCF finished eighth in the final rankings, nowhere to be found in the committee’s playoff discussion. The Knights will put their 25-game winning streak on the line against another SEC team after beating Auburn in the Peach Bowl last season. The committee didn’t buy it and stayed with the one consistent data point throughout the five years of playoff selections: No team with more than one loss has ever made the playoff. Ohio State was the first team out last season and again was squeezed because of a lopsided loss to an unranked team. The Buckeyes were blown out by Purdue in October, similar to the way they lost at Iowa in 2017. Georgia has been rolling since losing by 20 at LSU in October and had Alabama on the ropes before the Tide erased a 14-point deficit. The Bulldogs proved they could hang against the best, but it was not enough to sway the committee into making an unprecedented playoff pick.